No Starch Press is giving away 20 books as prizes! The Top 10 best feedback survey results will be selected by the Small Basic team, who is looking for quality insights. 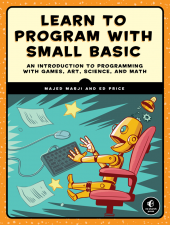 Learn to Program with Small Basic brings code to life and introduces you to the empowering world of programming. You’ll master the basics with simple activities like displaying messages and drawing colorful pictures, and work your way up to programming playable games! 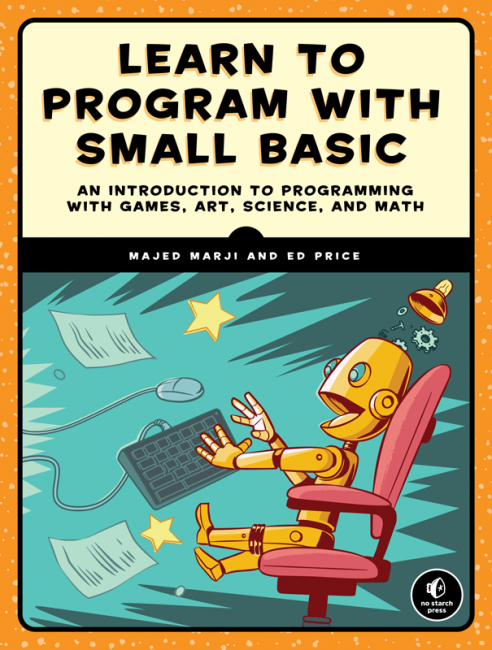 The book is written to about a 13-year old audience, but kids can start reading it at a younger age, and adults will find it as a great way to ease into text-based computer programming! It’s designed so that anybody can read it on their own, but it’s packed full of useful problems and challenges to be an asset for teachers and students. That includes the code from all the programs you learn in the book (both incomplete versions, to challenge the students, and the final versions of the code to compare and learn from), as well as both for all the challenges and practice assignments. And it also includes a list of test-like questions and online resources for every chapter as well! And finally, it features a thread of random humor (to keep students on their toes) and some valuable connections into the Small Basic online community engagements. Remember to take the survey to be eligible for the prizes!